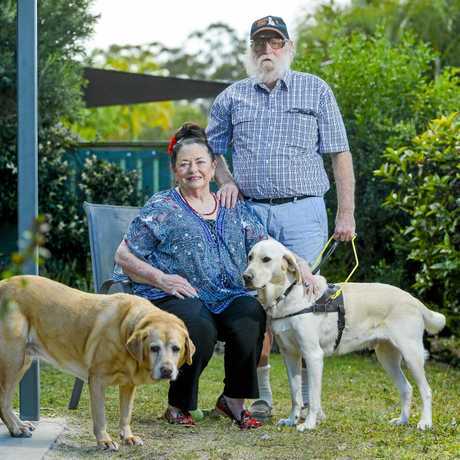 GLADSTONE'S much-loved guide dog Queeny has gone to doggy heaven. The faithful sidekick to Calliope's Dave Byars lost her short battle with a liver tumour and had to be euthanised on October 8, aged 11. 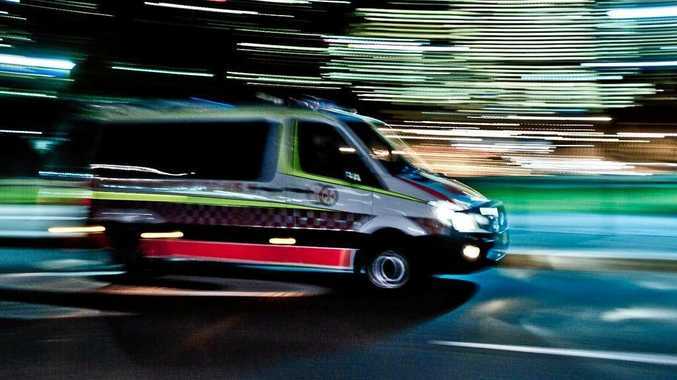 "She became ill and within four days a decision had to be made. I was with her right until the end and she was strong," Dave said. "What amazed me was how she still wanted to appease me right to the end." 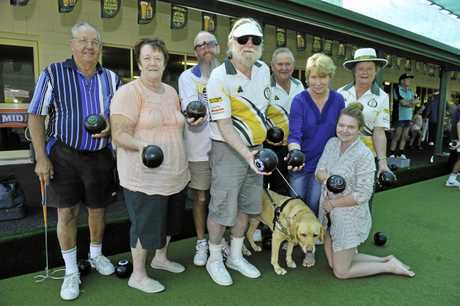 Labrador Queeny became somewhat of a celebrity during her time with Dave and was a regular visitor to Calliope Bowls Club. "She just charmed and had so much patience. Even though I can't see the dog she was very appealing to everybody," he said. That appeal extended to brushstrokes of paint. "About a year ago I got Val Cruwys to paint Queeny in harness and on her death I thought this will be my memorial to Queeny," Dave said. "With the help of friends I got a plaque on the bottom of it with 'Queeny born 26th May 2007 and her death October 8, 2018' and underneath that I put 'a guiding star' and got it framed. "Now it hangs over my dining table, not that I can see it but everybody that sees this painting says what a remarkable capture of her and what a great memorial to have for her." Dave was matched with Queeny when she was 22 months and continued to serve him until anterior cruciate ligament surgery put her out of action and into retirement late last year. 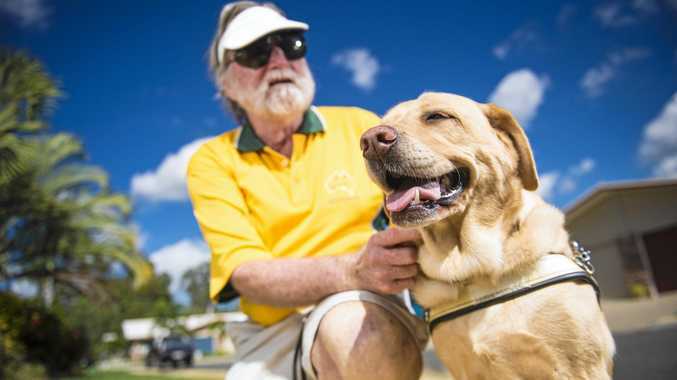 Then two-year-old labrador-golden retriever cross Trevor came into Dave's life. "I got the phone call in December and was matched with him, went down and met him in January and started training with him and he was brought up here in February," he said. "He was here a few days before we brought Queeny home because I wanted him to settle in and of course she got the shock of her life when she came home and found another dog in the house. "They lived compatibly from February right through until October." 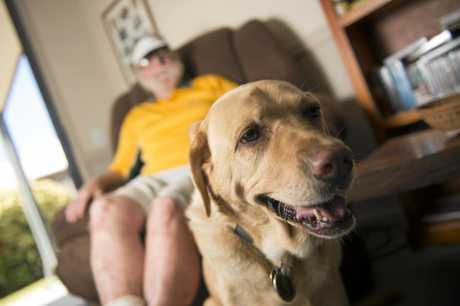 Dave said Queeny had many endearing qualities that made her a one-of-a-kind guide dog. "It was her patience and unbelievable decision making in big cities on transport and pedestrian ways," he said. "But I think in retirement initially I had to be very careful which dog was stepping into the harness because I'd stand at the door and get the harness and she'd push past Trevor to get her head in the harness - she still wanted to keep working. "His harness was a different size to hers and even the instructors were saying 'Dave I'd be checking which dog you've got there' because obviously I can't see. She didn't take to retirement very easily." Dave said Trevor knew what was going on at the time of Queeny's death. "I suppose he was a bit lost. He was there when she was euthanised. He's adjusted now to being the number-one dog but all dogs are different and there will never be another Queeny," Dave said.